Windows may have many drawbacks, old outdated ways and some things that are just pure crap. But one of the most incredible, and perhaps also under-rated features is the Windows taskbar. It has been around since Windows 95. A single panel that contains all system controls, icons, currently running tasks, the start button and now your favorite apps as well. Apple’s macOS uses a dock at the bottom and a menu bar at the top. Ubuntu does this a bit more efficiently with the dock on the left, but the desktop still takes up more space, unlike Windows. Sure, the dock looks prettier, but the taskbar is simply a more efficient use of space. 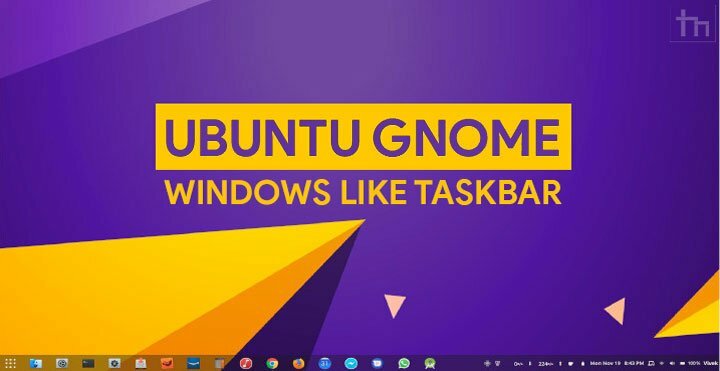 It’s understandable if some people do like the taskbar. On the GNOME desktop, you can easily disable the top panel and turn the dock into a taskbar. Follow the link below and turn on the toggle, then select Install when the popup appears. The extension will be installed and enabled immediately. You should see your top panel disappear and a taskbar appear. To configure the extension, you’ll need to access the configuration module. You can do this from the GNOME Tweak Tool by clicking on the gear icon next to the extension. 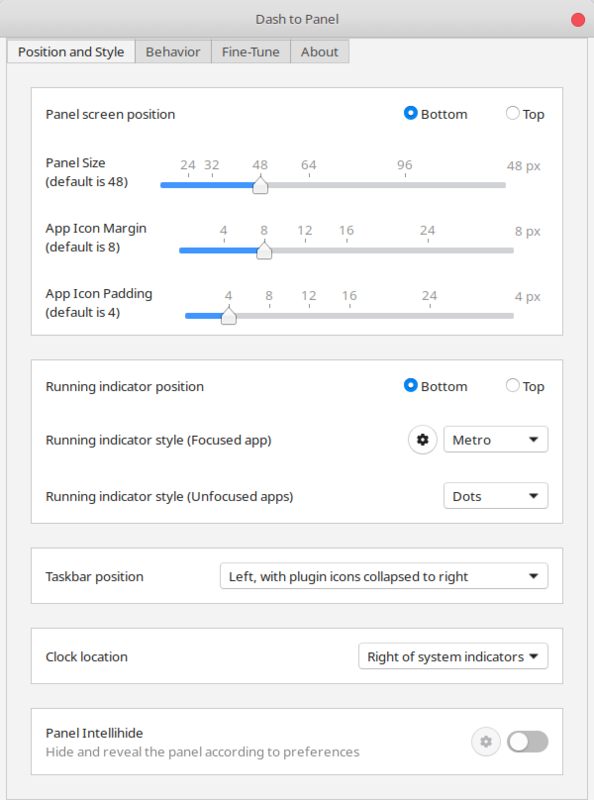 If you don’t use GNOME Tweak Tool, visit the Dash to Panel web page again from the link above and you should see a settings button next to the toggle. Click on it. When the configuration module opens up, you’ll find your GNOME taskbar is a whole lot more customizable than the Windows taskbar could even imagine, if it could imagine. From the panel size, icon margin, padding, to how the running apps are highlighted and where the icons are places. Windows users have long been trying to find ways to center the taskbar icons. On your GNOME taskbar, this is as easy as selecting a center layout from the Taskbar position drop-down menu. There’s a lot for you to explore here, but there’s one thing you may definitely want to change. Under the Behaviour tab, towards the bottom, you’ll find a drop-down menu next to the label Click action. This defines what happens when you click on the icon of a running task. Traditionally, the click action is expected to minimize the window of the currently running app. On Ubuntu, because this isn’t the default action on the dock, this isn’t the default action in your taskbar as well. Therefore, you might want to select Minimize window from the drop-down menu. Here you can also define other click actions by clicking the gear icon. For instance, what happens when you click while holding the Shift key, or click with the middle mouse button, etc. 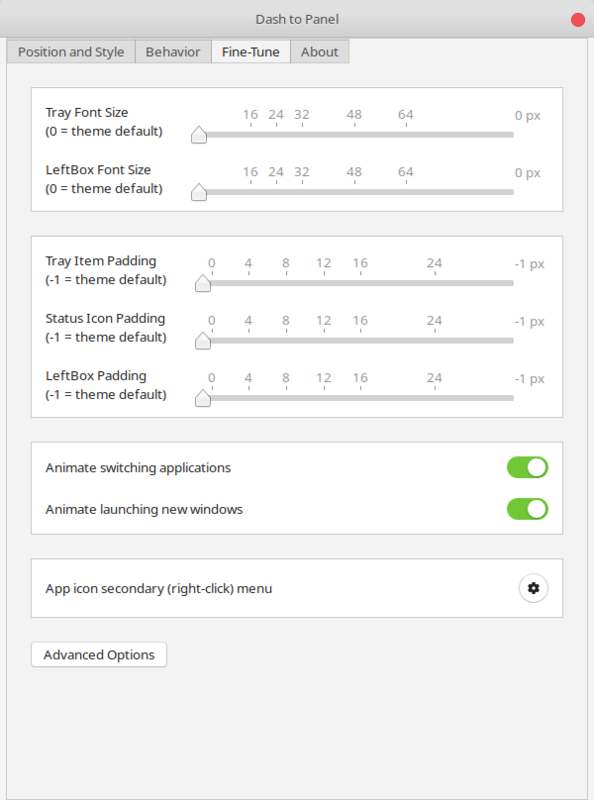 Next to the Behaviour tab is Fine-tune where you can modify the appearance of the tray icons the way you can for the taskbar icons under the Position and Style tab. 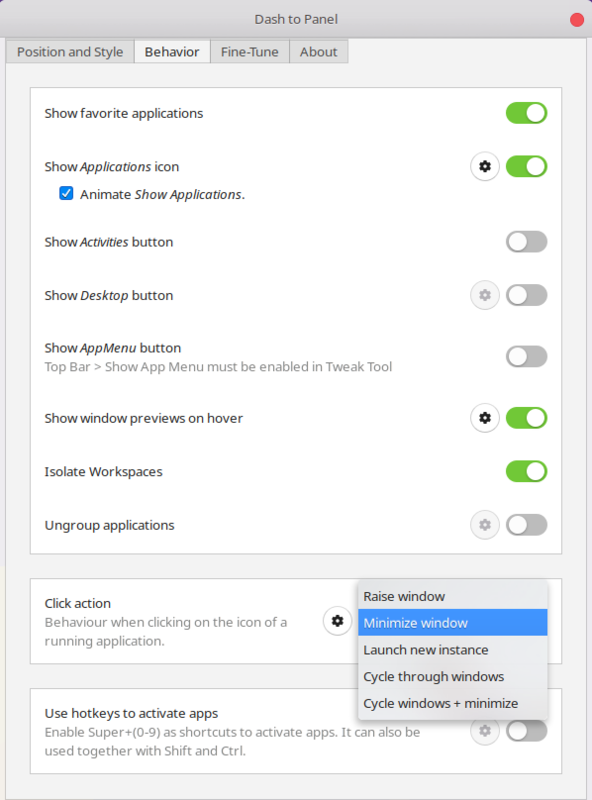 You can also toggle on or off app launching and switching animations as well as modify the right-click menu. By default, right-clicking on an app icon shows the option to Quit, if the app is running, Remove from favorites, and the app’s own right-click menu. You can change this by clicking on the gear icon next to App icon secondary (right-click) menu.